Luke Holton doesn’t know 48-year-old Sharon Buis, but he’s helping to organize the volunteer search effort that started Wednesday, less than one week after Alaska State Troopers called off the official search. “I’m an outdoorsman myself and I understand if I was out here in the cold, I wouldn’t want anyone to give up on me,” he says. Holton and other volunteers have set up a search table at the bottom of the Mt. Roberts Tramway and meet there each morning. On Wednesday, three teams of three searched Granite Creek Basin and Perseverance Trail, getting off the trail as much as possible when safe to do so. Thursday afternoon, Holton was on top of Mt. Roberts, along with six other volunteers. They hiked to Icy Gulch and are sending skiers there by helicopter Friday. These areas were covered extensively during the five-day search led by the Alaska State Troopers. But Holton says there’s no reason to give up hope of finding some sort of clue. “It’s unlikely that we’ll find anything too positive at this point, but for the family’s sake, we want to keep looking no matter what we find,” Holton says. Holton met with Buis’s brother and sister-in-law who came to Juneau from Ontario, Canada. He says they left Thursday but asked to be kept updated on the search. One of Buis’s hiking friends said Buis owned a yellow backpack. It’s an unofficial lead, Holton says, but it’s something to look for. He hopes the volunteers can find anything that will restart the official search. Trooper spokeswoman Megan Peters says a decision to start searching again will be based on what’s found. “It’s going to be evaluated based on what is located and if we can confirm it belonged to Ms. Buis or not. Certainly if they find something and it is identified as one of her possessions, it gives us a new place to look,” Peters says. Buis is in the Alaska State Troopers Missing Persons Clearinghouse, a database for law enforcement only. Peters says any missing person in Alaska is entered into the database and stays there until they are found dead or alive. She says a volunteer search group could help close a missing persons case. “Troopers can’t always be everywhere. There are a lot of things that we have to go and put our attention to and our resources towards. Certainly with search and rescue cases, we want them to have a positive resolution. And finding somebody even if they’re deceased at that point, at least we can provide some type of closure. We can return them to their families,” Peters says. When Troopers called off the search and rescue effort May 29, Juneau Police Department took over the case. Spokeswoman Erann Kalwara says detectives started working on it this week. “The detective has started reaching out to the missing person’s friends and her family, just discussing things that had been going on in her life, talking about where they think she might be, if they have any ideas of any lead that he could investigate, just trying to ensure that if she was hiking and she went missing, that that’s truly what happened,” Kalwara says. She says they have no reason to believe anything suspicious occurred although they haven’t ruled anything out. Juneau police are in the process of collecting Buis’s dental and medical information to enter into a database of the National Crime Information Center. Kalwara also says there’s no information to connect Buis’s case with Sandra Gelber, the 61-year-old woman who died May 4 after being found in the water off Salmon Creek Trail. Both women were physical therapists and both cases are linked to hiking trails. Buis has been missing since May 24. When she didn’t show up for a planned group hike with the Juneau Alpine Club that morning, a friend reported her missing. Buis was last seen May 23. 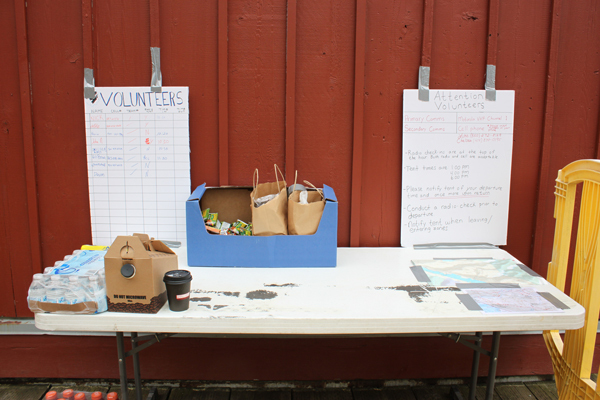 The volunteer search effort for Buis continues this weekend. Community members interested in helping should meet at the bottom of Mt. Roberts Tramway at 9 a.m. Friday, Saturday and Sunday. And look for Luke Holton’s messages on the Facebook group Juneau Buy ~ Sell ~ Trade.